The main downside to upholstered furniture is its ability to soak up stains and dirt over time. If you have a stained piece of upholstered furniture that you can’t seem to get clean, the tips below may help you find a solution to your problem. 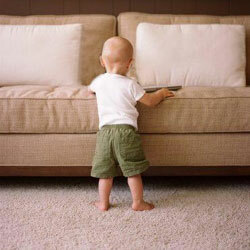 Check out this guide showing how to remove stains and clean upholstery so you can protect your furniture in the future. Before you do any sort of stain removal, you need to vacuum your upholstered furniture. This will get rid of the dust and dirt on the surface that may prevent the cleaning solutions from effectively soaking through. If possible, use a vacuum hose nozzle that has bristles around the rim because that will trap hair and loose fibres that may not easily go up the tube. You can pull out anything that gets trapped when you are finished vacuuming. If you manage to catch a spill when it first happens, try to blot it away to minimise staining. Once you have blotted it up with a washcloth or paper towel, you can add a little bit of water and blot again. Be careful not to scrub the spill at this point because that will cause it to spread. All you want to do here is pull as much of the liquid out of the upholstery as possible. W: Use a water-based detergent. S: Use water-free cleaner, like a dry cleaning solvent. WS: Use either of the options above, depending on the stain. X: Take the product to a professional cleaner. Do not use any upholstery cleaner on the fabric. Only vacuum and blot it dry. If you do not have a tag or code to look at, you may want to test your cleaner on an unseen part of the furniture to see if it discolours the fabric. It’s best to check somewhere underneath the furniture where the fabric has been pulled over the edge. If everything turns out okay, you can use your detergent on the actual stain. Consider using green cleaning products when possible to minimise the environmental impact of your cleaning. This will also help you avoid putting harsh chemicals on delicate fabrics. You can make these products at home and put them to use in no time. You’ll save money and help the earth at the same time. If you have access to a steam carpet cleaner, you may want to try that for your upholstered furniture. This may not work well for heavily set-in stains, but it can clean off surface stains without forcing you to scrub them. This is the perfect solution for people who have respiratory conditions because the steam will not release any chemicals into the air. Count on the heat and moisture to clean off the fabric for you. Follow the guide above to remove stains and clean your upholstery so your furniture will look its best; however, if you are in doubt, contact an upholstery cleaning professional who has the skills and training needed to make your furniture look like new again.